Classic musical adaptation of the L. Frank Baum novel starring Judy Garland, Ray Bolger, Bert Lahr and Jack Haley. A tornado whisks Dorothy (Garland) and her house from Kansas to Munchkin City, squashing the Wicked Witch of the East upon landing. The Wicked Witch of the West (Margaret Hamilton) vows revenge, while Dorothy sets off on the yellow brick road to see the Wizard of Oz (Frank Morgan), hoping he can tell her how to get home. On the way she makes friends with a scarecrow (Bolger), a tin man (Haley) and a cowardly lion (Lahr) - all of whom have specific reasons for wanting to meet the magical Wizard. With the Wicked Witch out to get her, will Dorothy ever get home again? 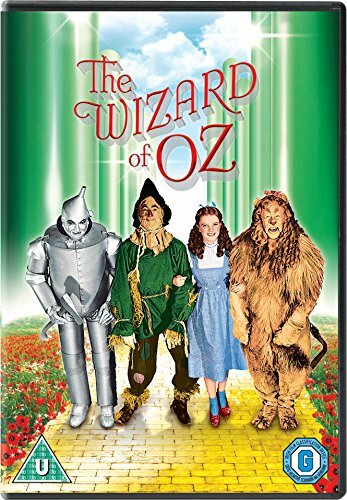 Extra Content 2-disc collection with over 2 hours of extras, including all new feature length documentary Making of the Wonderful Wizard of Oz'. Discover how this unprecedented production overcame the odds to become a movie classic and form an integral part of American culture. Plus commentary by Historian John Frike with the film's cast and crew, Sing-along feature and much more.